Help Elmsley the Rabbit push the manhole covers back onto their bases, to stop the Fox from getting in to his warren. This is a cute puzzle game with a natural swipe based control and no time limit. 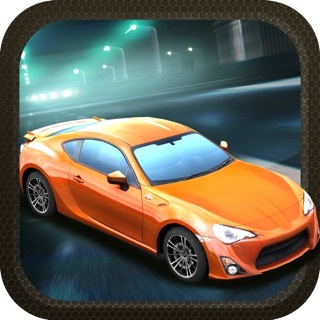 You are always kept in the centre of the action, the game is quick to pick up and you have an unlimited undo feature. 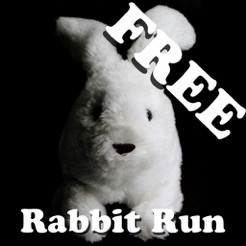 This is the FREE/Lite version of 'Rabbit Run, it includes 10 levels which give you a little taste of the puzzles in the full version. This is a fine sokoban game. 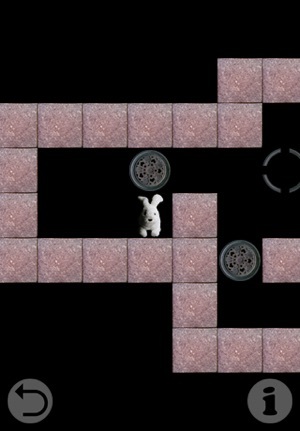 The board is visually pleasing and the rabbit moves smoothly and easily. I did move him unintentionally in the wrong direction a few times but this did not happen very often. Undoing each (individual) move is an important option as is the ability to skip back and forth among the levels. My issue involves the general view of the board. Only part of the board is (often) seen. Sokoban can be challenging enough without the need to hide parts of the board. The program can definitely use an option to either zoom out - to see the whole board - or some other option to see other parts of the board whenever I like, rather than having to (arbitrarily) move the rabbit, just to see other board areas.